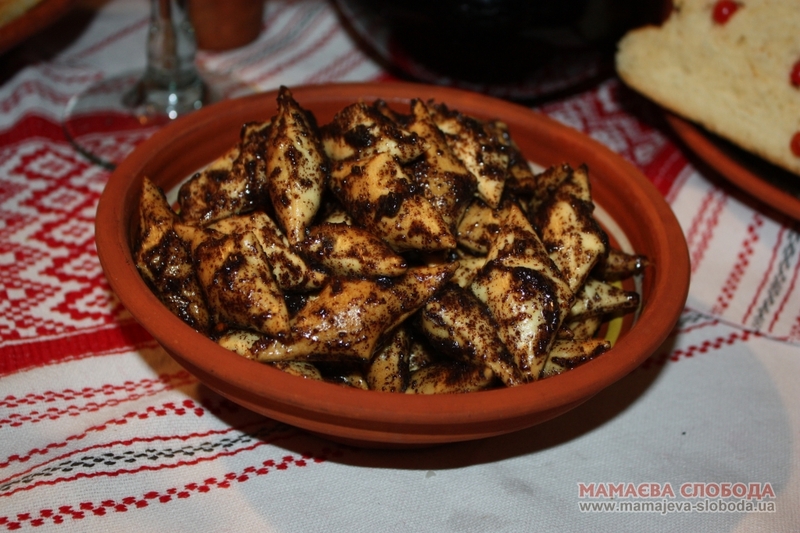 Honey Shulyk | Шинок "Коса над Чаркою"
One of the oldest traditional Ukrainian dishes. To prepare this dish they sifted flour, added salt, baking soda, poured water and ½ cup butter, made dough and let it go get ready. Meanwhile, they grinded poppy in the bowl ‘makitra’, so that it gave a poppy milk and poppy had become dark brown. The dough was mixed again, rolled down to make shortbread thick as a finger, than they made cuts and pierced to get rid of blisters. After all they fried them on ‘rynka’ (frying pan) on both sides. Just cooked caked pinched into pieces by cuts, placed into ‘makitra’ or deep bowl, poured with honey and sprinkled with cinnamon and poppy seeds.